Years ago I got one of these. I was so fascinated with it that I couldn't bring myself to devour it. The little reindeer candy cane hung on the tree and it taunted my little sister with its delicious cuteness. She of course had no problem eating hers because she did have quite a weakness for candy canes. I was impressed with the simplicity of the craft. The genius of it. How perfect of a treat. I don't remember what that reindeer cane's fate was, me, my sister or the trash. It was a few years later that I ventured down the path of recreating them for my high schools friends. I passed them out to people, reserving them for my dearest pals and teachers first and passing out the rest to others who looked like they needed one. What fun those little treats brought. Even those broody kids managed to break out from their cloud and give a smile. Simple acts of fun does make a difference. I long forgot about those reindeer until after college and office work began. I remembered how those candy canes made people smile and I decided that even "grownups" need some fun too. It became a tradition of sorts. Making them is easy but does require some patience and prep. First you'll need to cut your pipe cleaners to size. To make the antlers you'll need one 6 inch piece and two 2 inch pieces. I do not accurately measure these pieces, I cut them to approximate size. If the pieces are too long you can always trim the excess, so make them slightly bigger if you are nervous about the length. 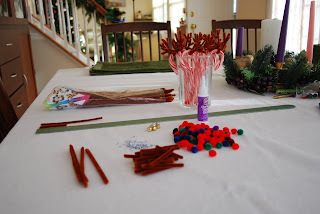 Take the 6 inch piece and place the middle of the pipe cleaner on the middle of the underside of the candy cane's hook. 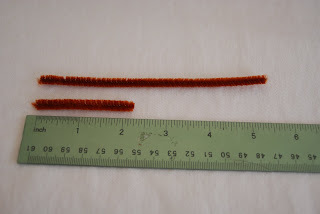 Fold the pipe cleaner in half having the sides meet together at the topside of the hook. Twist one full twist then separate them to form a soft V shape. Take a 2 inch piece of pipe cleaner and wrap around one branch of the V, about in the middle. Repeat with the other piece. The antlers will look a little bit like a Saguaro cactus. You can make them even or if you prefer a little offset to give the antlers a more natural look. Once your little reindeer's antlers are done place it inside that wide mouth jar or glass and continue making more. After all of your antlers have been wrapped and bent to your taste it is time to add the eyes and nose. I have used several varieties of glue and so far I am pleased with the hot glue gun and Aleene's Fast Grab Tacky glue. 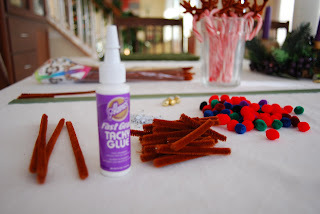 Always a hot glue gun user I tried this fast grab glue so that the girls could help me and I am in love. It works very well and you don't have to worry about the safety issues of being burned. Begin by dabbing two small drops of glue in the spots where eyes would go, below the antlers on the candy cane's hook. Gently place the eyes on the glue and press to secure. Next squirt a pea sized amount of glue at the end of the candy cane's hook for the nose. Select your pom-pom color and gently press it into the glue. Hold for a few seconds. Put your completed reindeer in the glass to dry. Once they are dry begin the fun of passing them out to people.